This article is about the ski area. 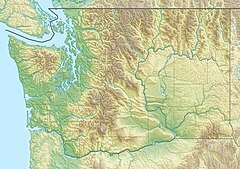 For the mountain pass along US Highway 2 where the ski resort is located, see Stevens Pass. Stevens Pass offers a variety of alpine ski runs ranging from beginner to advanced. Because there is no lodging at the base, Stevens is a day resort drawing heavily on skiers from the Seattle area. Night skiing is offered until 10pm most days (except Mondays and Tuesdays) during mid-season. The area is divided into front (north and east facing) and back (south facing) sides. Kehr's (formerly Big Chief) is a fixed double below Big Chief Mountain, providing access to a very consistent cruiser with small bumps on the left side and an ungroomed steep bump slope leading to a valley on the right side. Hogsback is a high-speed quad providing access to intermediate runs and some more advanced tree runs. Skyline is a high-speed quad that offers the longest intermediate runs on the front side of the mountain. Brooks is a fixed double lift that primarily provides access to the terrain park. Seventh Heaven is a fixed double that accesses double-black diamond runs near the top of Cowboy Mountain and is accessed by the Skyline lift. Double Diamond is a fixed triple that provides access the backside and also to Double Diamond, Big Chief Bowl, and Wild Katz, all experts-only extra-steep ungroomed runs and is accessed by Kehr's. Jupiter Express - a high-speed quad that unloads next to the top of Tye Mill. Southern Cross - a fixed triple that is the same physical lift as Double Diamond on the frontside. The Stevens Pass Nordic Center provides access to 28 km of groomed cross-country ski trails of varying difficulty. The ski resort was started by Don Adams and Bruce Kehr, both passionate skiers, in the winter of 1937-38. The original lodge was constructed in 1937 by the CCC, a government funded work force. In 1940 this lodge burned down. In 2011, Stevens Pass was acquired by CNL Lifestyle; operations were turned over to the operator of Mountain High in California. In 2016, CNL sold Stevens Pass to Och-Ziff Capital Management. The area around Stevens Pass is known to be avalanche prone, having experienced the most deadly avalanche in U.S. history in 1910 when two trains were swept off the tracks and buried, killing 96 people. Out of a group of 16 experienced skiers, three men, Chris Rudolph, age 30; Johnny Brenan, 41, and Jim Jack, age 46; were killed in an avalanche at Stevens Pass on February 19, 2012. The avalanche occurred in an unmaintained back-country area known as Tunnel Creek, which was described as "ski at your own risk," after 3 feet of fresh snowfall. The growth of population in the Seattle area has led to increased use at all the Cascades ski areas in Washington, and Stevens pass frequently reaches capacity on weekends during January and February. In June 2007, a Master Plan was submitted to the Forest Service describing proposed future expansions and upgrades over the next ten years. Improve the mountain experience at Stevens Pass by diversifying its terrain offering, including a variety of trail width and aspect, as well as gladed terrain of varying difficulty. Increase the Comfortable Carrying Capacity of both the ski trails and the ski lifts to better match actual demand, making use of the majority of skiable terrain that is now underdeveloped. Balance the ski terrain skill max to match the market, within the limitations imposed by the Stevens Pass terrain. Provide additional 'in-bounds' and 'hike to' adventure skiing opportunities. Provide a diverse range of gladed and other off-piste skiing possibilities. Better manage lift accessed backcountry use. Improve guest satisfaction through lift and trail system upgrades. Relieve pressure and congestion in the base area with the establishment of on-mountain facilities. Develop new terrain, as well as re-grooom (grade) and re-vegetate existing terrain, with climate change predictions and Visual Quality Objectives in mind. Provide a small-scale snowmaking system focused on the super-pipe and facilities near the base area. Design new terrain development to bring a net gain in forest health and diversity with the SUP area. Develop a summer lift accessed Mountain Bike product to satisfy a growing demand, as well as other related, appropriate outdoor activities. Plan for and develop other mountain products and facilities as use increases. A northern exposure area is planned to the left (east) of the current Big Chief lift, with a Northern Exposure detachable quad providing access to runs and glade skiing. This expansion would add 115 acres (0.47 km2) of total terrain. Brooks will be upgraded from a double to a triple. If easy access from the top of Skyline can be established, Brooks will be shortened to end at the top of the terrain park. A Grace Lakes area is planned to the right of the top of Brooks, heading off downhill to the right (north), consisting of groomed cruisers and gladed runs. The area would be served by a fixed quad lift, and add 80 acres (320,000 m2) of total terrain. Additionally, there would be new adventure runs from the top of skyline down into the Grace Lakes area. Big Chief would be upgraded to a fixed quad, and the loading area would be moved slightly down the mountain to improve access. A new fixed quad "The Katz" would be added to the right of Big Chief, extending up and to the right. Backside improvements happen at the right (east) side. To the immediate right of Southern Cross, new trails and glades provide expanded area, and a proposed permit expansion into Highlands Bowl to the right of that would provide a backcountry experience for those willing to do some hiking. A catch trail at the bottom would return to Southern Cross. This expansion would add 75 acres (300,000 m2) of terrain. There are no lift changes planned on the backside, although a plan to upgrade Jupiter from a fixed quad to high-speed quad was announced during the 2012/2013 season  and completed before opening of the 2013/2014 season. Solitude lodge would be constructed near the top end of Skyline. Smaller yurts would be constructed at the top of Tye mill, at the top of the terrain park, and at the base of the lifts in the back. The base lodges would be expanded and reconfigured. A new mini-lodge and ticket area would be constructed at the base of the Northern exposure lift. 470 new parking places would be added. ^ "Vail Resorts Closes Its Acquisition of Stevens Pass Resort in Washington | Vail Resorts Corporate". news.vailresorts.com. Retrieved 2018-09-08. ^ L, Peter; sman (2017-09-16). "In a Booming Region, Stevens Pass Looks to Expand". Lift Blog. Retrieved 2017-12-06. ^ Three skiers killed in Washington avalanche, KTVK 3TV News. ^ Snow Fall: The Avalanche at Tunnel Creek, John Branch, The New York Times.